Venezuela has been a cradle of shortstops since 1950, when Alfonso “Chico” Carrasquel made his debut in the majors with the Chicago White Sox. In his steps followed Luis Aparicio, the only Venezuelan in the Hall of Fame in Cooperstown, Dave Concepción, Ozzie Guillén, and then another shortstop who played more games at that position than at any other in the majors: Omar Enrique (González) Vizquel. Vizquel was born in Caracas on April 24, 1967, to Omar Santos Vizquel and Eucaris González, the eldest of three children. He has a younger brother, Carlos Alberto (born 1970), and Gabriela (1980). His love for baseball was instilled by his father, who passed away in 2016. When he was 8, Omar’s father took him to the Lyceum Gustavo Herrera to join a children's team, Gran Mariscal, of the Leoncio Martinez League, an affiliate of the Criollitos of Venezuela Corporation, a youth movement similar to the Little League organization. With Gran Mariscal, Vizquel developed his skills and managed to represent Miranda state in several national and international tournaments, along with another future big-leaguer, Carlos Hernández, who caught for the Los Angeles Dodgers. In 1977, in a Little League Baseball World Series, contested by 12 countries at Universitario Stadium in Caracas, Vizquel’s glove work began winning him fans and was instrumental in Venezuela’s winning the title. He was only 10 years old. These tournaments were played in one of the stadiums of the Venezuelan professional baseball league before winter league games, so Vizquel had the opportunity to meet some of his predecessors, Chico Carrasquel, Aparicio, and Concepción, his main idol and the starting shortstop for the Cincinnati Reds, who also played in Venezuela with Tigres de Aragua. The shortstop of the Big Red Machine was a big influence and motivation to Vizquel when he decided to pursue the dream of becoming a professional baseball player. One of his teammates on the Gran Mariscal team was Luis Morales, son of Pablo Morales Chirinos, one of the owners of Leones del Caracas, the Venezuelan Winter League team to which he was invited to attend practices at age 16. Vizquel signed as a free agent with a non-guaranteed bonus of $4,500, in 1984. He received $2,500 up-front with the rest to come in installments of $500 at each step up the ladder. He immediately went to America and played Rookie League ball with the Butte Copper Kings; he hit for a .311 average in 15 games. His participation in winter ball with Leones del Caracas also helped him mature as a player and to better develop his skills. That experience helped Vizquel on his journey through Double-A (Vermont Mariners) and Triple-A (Calgary Cannons), in 1988, when he became a switch-hitter on the recommendation of Mariners hitting instructor Bobby Tolan. 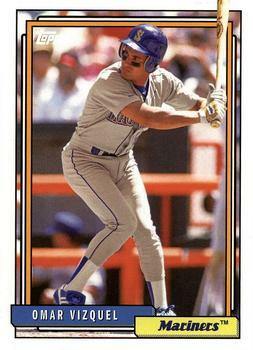 During 1989 spring training the Mariners had Rey Quiñones as first-string shortstop, but he reported late because of a contract dispute, which began to open the doors of the majors to the young Venezuelan shortstop. Díaz injured his right elbow and Vizquel had the opportunity to display his defensive talents, and he impressed Lefebvre, despite his weaknesses as a batter. At just 21 years old, a few days shy of 22, Vizquel received the news on the last day of spring training. Vizquel's debut came on Opening Day, April 3, 1989, at the Oakland Coliseum, facing the reigning American League champions, the Oakland Athletics. Vizquel was not the only rookie debuting in Lefebvre’s lineup. So was Ken Griffey Jr., from the start a media sensation. Vizquel did not make the best of impressions in his debut, with a fielding error on Carney Lansford’s roller in the third inning, followed by a Mark McGwire home run, which made all the difference in the A's 3-2 win over the Mariners. Vizquel's first campaign was not his most productive. He finished with a .220 batting average, the lowest of his career, but he learned how to handle the pressure of playing as a shortstop in major-league baseball. Vizquel began the 1990 season on the disabled list after suffering a sprained MCL in the left knee; he played in only 81 games, batting .247 and making seven errors. He played 142 games in 1992; his batting average slipped to .230. Nevertheless, Seattle remained confident in his abilities. By 1992 Vizquel was considered one of the best defensive shortstops in the American League. That season he made only seven errors for a .989 fielding percentage, the best in the majors. For the first time he was a candidate for the Gold Glove Award, though Cal Ripken Jr. got the nod. His reward came the following year, when he turned 108 double plays, tied for the league lead. His fielding percentage of .980 and the growing appreciation of his talent combined to win him his first Gold Glove. One standout moment occurred on April 22, when he preserved Chris Bosio’s no-hitter against the Red Sox by making a barehanded grab of an Ernest Riles chopper and firing to first for the last out of the game. Vizquel felt settled in Seattle, where he took up residence and married his first wife, Nicole Tonkin, but his plans changed when he was surprised with the news that he had been sent to the Cleveland Indians on December 20, 1993, in a trade for Félix Fermín, Reggie Jefferson, and cash. The Mariners were making room for a talented youngster named Alex Rodríguez. “When I got the news that they traded me to Cleveland I felt pretty bad. I was down. I wanted to be on a team for 20 years. I did not want to move anywhere else,” he said. “I felt good with the Mariners. I had married that year, had bought my house. It was like they gave me a slap in the face, and I had to move to another organization where I knew no one. 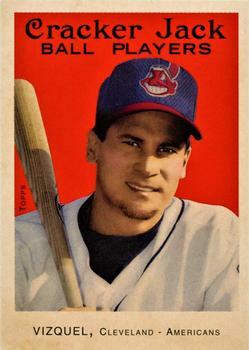 Vizquel joined a group of Latinos who helped the Indians change their image from that of a perennial loser, which was satirized in the 1989 movie Major League. The Indians had put together a very competitive club in 1994 with Manny Ramírez, Carlos Baerga, Sandy Alomar Jr., Tony Peña, Dennis Martínez, José Mesa, Julián Tavárez, Álvaro Espinoza, Rubén Amaro Jr., and Candy Maldonado. That group, together with Kenny Lofton, Albert Belle, Jim Thome, Eddie Murray, Charles Nagy, and Jack Morris, helped the Indians to a 66-47 mark, just a game behind the Chicago White Sox for the American League Central lead when the season was suspended because of the players' strike. Vizquel, who on April 7 that year got the first stolen base in the history of Jacobs Field, the Indians’ new home ballpark, won the second of nine consecutive Gold Gloves in the American League. There was no strike to stop the 1995 Indians, who were reinforced by veterans like Orel Hershiser and Dave Winfield, and reached their first World Series since 1954. The Tribe swept the Red Sox in three games in the Division Series and dispatched the Seattle Mariners in six games in the American League Championship Series, after having 100 victories in a regular season limited to 144 games by the delayed start of the season. The Braves, with Bobby Cox as manager, had reached the fall classic in 1991 and 1992, but in 1995 their pitching looked even better with Greg Maddux, Tom Glavine, and John Smoltz, all future Hall of Famers. In 1997 Vizquel returned to the fall classic with the Indians after playing a key role in eliminating the defending champion New York Yankees in five games in the ALDS. With the Yankees ahead in the series, two games to one, Vizquel forced a fifth and deciding game at Jacobs Field, hitting a single that drove in Marquis Grissom from second base in a 3-2 walk-off victory. The Tribe won the next day, 4-3. Vizquel ended the series with a .500 (9-for-18) batting average and four stolen bases. In the ALCS the Indians had their revenge on the Baltimore Orioles, who had eliminated them in 1996, and beat them in six games to advance to the World Series against the Florida Marlins. Vizquel was never closer to winning a World Series ring than that year and again was a key to forcing a decisive contest, Game Six of the Series. The Marlins led the Series three games to two. In Game Six at Miami’s Pro Player Stadium, Cleveland had a 4-1 lead after five innings, due in large part to Vizquel's glove. In the sixth inning, with men on second and third and two outs, the Marlins’ Charles Johnson hit a grounder in the hole and Vizquel made a spectacular diving catch to throw him out at first and prevent two runs from scoring. In the deciding Game Seven, with Cleveland two outs away from winning the ultimate prize, the Marlins tied the game in the ninth inning and then won it, 3-2, in 11 innings on Edgar Renteria’s walk-off hit. 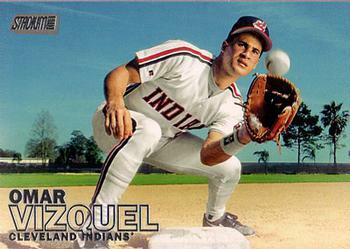 In 2001, Vizquel won his ninth Gold Glove, matching the American League record held by Hall of Famer Luis Aparicio. He also played in his last postseason. The golden years of the Tribe were over. Only Vizquel and Jim Thome remained from the winning core that had been formed in the mid-'90s. Thome left as a free agent after the 2002 season, in which Vizquel set career highs in home runs (14) and RBIs (72), and took part in his third and final All-Star Game, being the sole representative of the Tribe. The Indians were rebuilding in 2003 and Vizquel, with an injured right knee, played in just 64 games. In 2004, at the age of 37, he returned with a solid .291 average, but the Indians had other plans for 2005 and gave the position to rookie Jhonny Peralta. On November 16, 2004, Vizquel signed a three-year, $12.25 million deal with the San Francisco Giants, moving his magic glove and experience to the National League. In 2005 Vizquel had a brilliant debut in the Bay Area, winning his 10th Gold Glove to surpass Luis Aparicio’s record for the most Gold Gloves won by a Venezuelan. The following year he repeated the honor and became the oldest shortstop to obtain the distinction. On May 13, 2007, Vizquel broke the record for most career double plays turned by a shortstop after reaching 1,591, surpassing the 1,590 of Ozzie Smith. His years as a regular shortstop ended the following season, but not until after he established a major-league record for most games for a shortstop with 2,584, surpassing another mark held by Luis Aparicio. When he retired, Vizquel’s career total at shortstop was 2,709. He maintained his physical condition at the highest level, despite his 41 years, but clubs were not very interested in giving him a starting spot. He was seen as a utility player and mentor of young figures, like fellow Venezuelan Elvis Andrus when Vizquel went to the Texas Rangers in 2009. In his one year with Texas he played only 62 games and made no errors, having his only perfect defensive year. On June 25, in Arizona, he surpassed Aparicio as the Venezuelan with the most major-league base hits, with 2,678. In 2010 Aparicio graciously allowed Vizquel to wear his retired No. 11 jersey with the Chicago White Sox, after the newly acquired utilityman failed to secure his usual number 13 — that was worn by his new manager Ozzie Guillen, who was also a Dave Concepcion fan. In 2012 he signed a minor-league contract with the Toronto Blue Jays and managed to make the team in spring training. This time he wore number 17, in honor of Chico Carrasquel, because Brett Lawrie had number 13. He participated in 60 games, his last game at shortstop coming on October 3 in Toronto. In his final game, he went 1-for-3 against the Minnesota Twins, getting his 2,877th hit and passing Mel Ott on the career hits list. (Two weeks earlier, on September 19, he had collected hit number 2,874, passing Babe Ruth.) He finished his career as the only player with 24 straight seasons at shortstop and, at age 45, the oldest player to play that position. Just other five major-league shortstops have more career hits than Vizquel: Derek Jeter, Honus Wagner, Cal Ripken Jr., Robin Yount, and Alex Rodríguez, all with over 3,000. Vizquel finished with a career line of .272/.336/.352, with 456 doubles, 77 triples, 80 home runs, 1,445 runs, 951 RBIs, and 404 steals, and he is one of just 11 players to accomplish 2.800 hits and 400 stolen bases. But his trademark was his fielding excellence. The Venezuelan finished his career with a .9847 fielding percentage, the best in MLB history, just above Troy Tulowitzki (.9846) as of 2018. He the leader in games (2,709) and double plays (1,734) as a shortstop, and ranks third in assists (7,676). His 11 Gold Gloves ranked him second as a shortstop, just behind the 13 that the first-ballot Hall of Famer Ozzie Smith won, another glove wizard with whom he was often compared. After 24 seasons playing in the majors, Vizquel decided to start a coaching career after spending his last four years mostly on the bench, as a utility player, passing his knowledge to young players while accumulating personal records when he got the chance to go to the field. On January 30, 2013, Vizquel was hired as a roving infield coach by the Los Angeles Angels. The next year he returned to the majors with the Detroit Tigers, who made him their first-base coach and infield and baserunning instructor. That association ended after the 2017 season. Vizquel, who was a candidate to manage the Tigers in 2018 (Ron Gardenhire was hired), got his first managerial experience with Venezuela in the 2017 World Baseball Classic, but his team couldn’t pass the second round. Vizquel came back to the White Sox organization in 2018 as the manager of their Class-A affiliate at Winston-Salem. He still resided in Seattle as of 2018, along with Blanca Garcia, his wife since 2014. They live near his two children, Nicholas, born in 1995, and Kaylee, who was adopted in 2007. Vizquel was inducted into the Cleveland Indians Hall of Fame on June 21, 2014, and was chosen by the fans as one of the Tribe's Franchise Four in 2015, alongside Bob Feller, Tris Speaker and Thome. Vizquel had his first shot at election to the Hall of Fame in 2018, when Chipper Jones, Vladimir Guerrero, Jim Thome, and Trevor Hoffman got the call, but he fell short with 37 percent of the votes. Nevertheless, his debut on the ballot was better than that of Aparicio, who finished with 27.8 percent in his first chance and finally made in his sixth opportunity. Vizquel, Omar, and Bob Dyer. Omar! My Life on and Off the Field (Cleveland: Gray & Company, Publishers, 2002). Cárdenas Lares, Carlos Daniel. Venezolanos en las Grandes Ligas (Fundación Cárdenas Lares, 1994). Various Authors. Todo lo que usted debe saber sobre Omar Vizquel (Grupo Editorial Macpecri, 2012). 1 Author interview with Omar Vizquel on January, 7, 2015. Unless otherwise noted, all comments by Vizquel are from this interview. 2 Author interview with Elvis Andrus on March, 10, 2018. Unless otherwise noted, all comments by Andrus are from this interview. 3 Author interview with Vizquel. 5 Luis Aparicio and Augusto Cárdenas, “Mi Historia: Luis Aparicio,” 2011.